Clerys workers will hold a one-year anniversary protest at the store today. FORMER CLERYS WORKERS who lost their jobs will rally outside the store today to mark the one-year anniversary of its closure. A total of 460 workers at the department store found themselves unemployed without notice when the store closed its doors suddenly last June shortly after it was bought by a company, Natrium, for €29 million. This included employees of Clerys as well as concession holders. Many of the workers had been employed at the department store for decades. Since its closure, the workers, back by Siptu, have fought for and won their entitlements. However, they continue to campaign for a change in the law to ensure other employees can’t be treated in a similar manner. The workers are seeking “a review of laws on the protection of employee interests when assets are separated from an operating company”, they said in a statement this morning. They will hold a ‘Time for Justice’ rally at 2pm this afternoon. A report into the store’s closure found in April that transactions similar to the Clerys situation should be made illegal. The workers are seeking for the report to be implemented. John Finn, a Clerys worker for more than 40 years, previously told The Journal.ie the workers want to keep fighting for others who may find themselves in a similar situation. “What happens doesn’t affect us, but it will for the workforce coming forward,” he said. Email “One year on, Clerys workers continue to seek justice for other workers”. 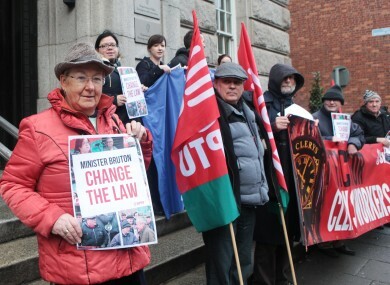 Feedback on “One year on, Clerys workers continue to seek justice for other workers”.